John "Herb" Rudolph (b. 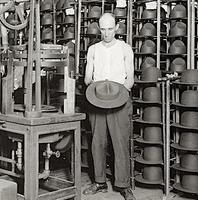 1901), worked at the Stetson factory in North Philadelphia for forty-nine years. In his 1982 oral history interview, Rudolph provided a first-hand account of the changing nature of factory work and of the American hat industry from his hiring in 1917 to his last day in 1966. “John H. Rudolph,” Philly Immigration, accessed April 19, 2019, http://phillyimmigration.nunncenter.net/items/show/836.